Cigarette smoking in rental properties topped the news this week, with dozens of reports regarding apartment fires across the country sparked by neglectful smokers. Two of those cases involved smoking near in-home oxygen tanks. In another case, one cigarette caused as estimated $50,000 in damage and displaced 17 other tenants. 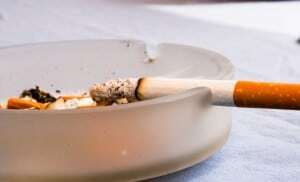 City housing officials in Kansas City, Missouri, the scene of a four-alarm high-rise apartment fire started by a cigarette, are considering instituting a smoking ban. Tenants who found themselves homeless due to the resulting smoke and water damage, support such a ban. They are also calling for more costly safety measures, including the installation of fire sprinklers in units. The majority of rental applicants favor a non-smoking policy in rental housing. Regulatory agencies like HUD are encouraging landlords to go smoke-free by providing free information about smoke-free leases. Many local housing agencies are providing free rental advertising for smoke-free housing. Landlords are not required to allow smoking in rentals, and courts have confirmed that smoking is not a legal right. However, if you are thinking of implementing a nonsmoking policy, you may be forced to stage the smoking ban by grandfathering in smokers with existing leases, and including the ban in new or renewing leases.